Winter is such a wonderful time to knit mittens, isn’t it? It makes more sense to knit them prior to winter so that they’re put aside, ready for use, when the cold comes, but I find myself thinking of them only when the cold hits. After knitting my squirrel mittens (many times over), I was ready for some fat yarn. David’s pattern was ready right when I was. DK weight yarn is a favorite of mine, so I had quite a stash to choose from. After some swatching, I settled on Rauma 3 ply Strikkegarn, a Norwegian yarn that, if it isn’t made for mittens, certainly seems like it is! It’s got that crunchy, crispy feel and deep sheen of a long wool, along with a long wool’s strength. The colors are absolutely striking. I doubt these mittens will ever wear out. One of my testers of the Fiddlehead Mittens pattern used Blue Sky Alpacas’ Brushed Suri for her lining and I’ve been wanting to use it myself, ever since. It’s soft as can be and amazingly warm, and a perfect weight for lining DK and worsted weight mittens. Yarn: Rauma 3 ply Strikkegarn in colors 141 (purple), 198 (lime green), 155 (blue), and 127 (orange), with Blue Sky Alpacas’ Brushed Suri in Gingersnap for the lining. Almost all of the skein of Brushed Suri- there are only a few yards left. The pattern was an absolute pleasure to knit. The charts are clear and large, so knitting just zipped along. The linings make the mittens into cozy little pillows for my hands. It’s just what I needed during these cold months. The fiber club renewals are up for February – April. If you’re a current member and would like to join again, go get ‘em! I’ll leave this up until the 26th, then start emailing people on the waiting list to invite them, if there are any slots left. Please note: I sent out a newsletter today and, as usual, about 20 were returned. Please add adrian at helloyarn dot com to your contacts. Please also note that the waiting list for the club is closed. If I ever manage to get through the current one, it will be so long from now that people’s email addresses will have changed. Starting a fresh one at that time seems like the best plan. * Woodstoves- As you might guess from the first photo above, there’s wood to be hauled around here! We installed a very beautiful woodstove this winter and have switched to heating with wood. Our lives very much revolve around chopping wood and feeding the fire, as well as enjoying the wonderful heat the stove provides. I’ve even bought a book on woodstove cookery. We’ll see how that goes! So far, it’s been fantastic to proof and raise bread dough by. I can’t recommend Morso stoves highly enough, if you’re in the market. This little tyke is heating our home wonderfully. * Peanut Butter- My life is changed. I’ve never had Hell’s Kitchen’s peanut butter before, but the recipe is online and holy doodle, this peanut butter is beyond imagining. Caro pointed out the recipe to me, as she is a fan of the restaurant’s peanut butter, and she also advised that the peanuts would be better roasted at 275F. Caro knows of what she speaks, so I did what I was told. The recipe makes about a liter, so I shared with 2 neighbors, who called last night to ask me to marry them. It’s that good. * The Outlander Series- How did I miss these books all these years? I am angry at every person I know who read this and didn’t command me to. A couple of friends and I are reading them now and giggle like schoolgirls over Jamie. The fact that he knits only adds to his charms. If you’re going to be kept indoors by the frigid weather, you might as well have a giant redheaded Highlander to entertain you! OMG I’M SO HAPPY YOU FINALLY BLOGGED AGAIN! i will not be removing you from my bloglines. also, i love that you blogged about jamie. i think i may have to too now. i may have to have a jamie only blog in fact. i may have to knit myself a jamie. sigh. oh and david’s eric mittens are to do for. an eric and jamie reference in the same post. be still my heart — or whatever. THANK GOD you resisted the urge to delete your blog. Those mittens are verra gorgeous. Aww, Outlander. Jamie has ruined me for all other men, lol. From now on I will ask everyone I meet if they’ve read this series, just to BE SURE. i’m laughing out loud at maryse’s comments!! am also resisting the urge to refer to #c*ckstands. clearly, i failed. do i need to add outlander to my goodreads queue? 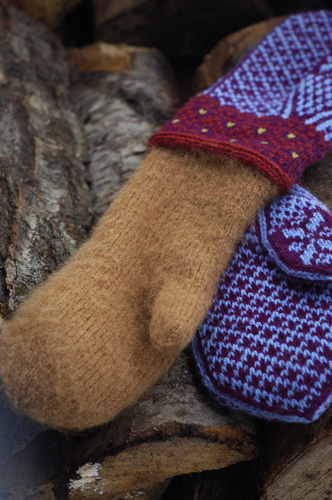 oh, and those mittens are freaking gorgeous. fantastic colors. 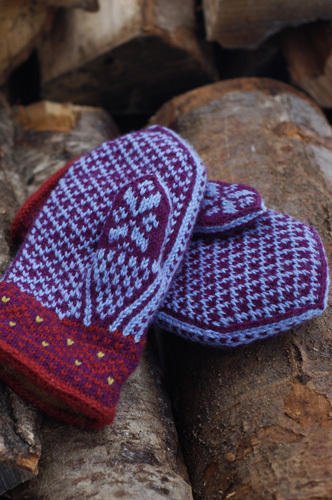 The Northman Mittens are fantastic. I love the colours. oh! i love the thumbs! too cute! Those mittens are gorgeous. I love the way you did the cuffs in the different colour combo. 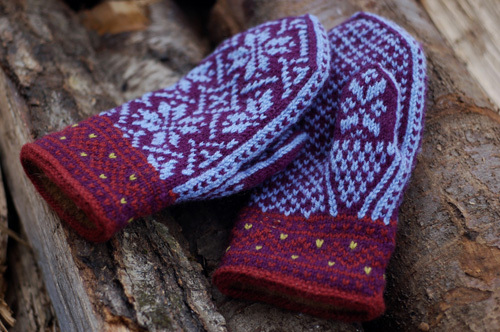 Just what I needed, another mitten pattern added to my favorites. I spent this summer reading the Outlander series and felt the same way you do. Why didn’t anyone tell me about these books?!?! I now have a huge crush on Jamie. I’ve read the first quarter or so of the most recent book. It’s so good I don’t want to put it down, but I’m trying to savor it too since it will be years before the next one comes out. I love dense, cozy mittens. Yours are adorable, and I can only mention the liners are decadently warm and cozy. I made a pair of your Snail Mittens two years ago, so I, too, could have cozy mittens, and my only sorrow is that it’s rarely cold enough where I live now to wear them! Adrian. I can’t figure out how to get on the waiting list. HELP! Enjoy the Outlander series, Adrian. My love for the books is great, but an even larger treat is the unabridged audiobook version, narrated by Davina Porter. She is the very best audiobook reader I’ve ever encountered. She could read the phone book and I’d be enchanted. I’m going to give that peanut butter a try, just as soon as I get home. Your new mittens are really beautiful. Like you, I can only seem to think of mittens in the winter! The good thing is that winter lasts a while on the East Coast! I love the Outlander series and I tell everyone to read them. If you ever get the chance to see Diana at a signing do so. She’s hysterical. And, yeah, my kids are named Jack and Jamie. Beautiful mittens! And so glad to hear another person has discovered the Outlander books…every time I read one I feel like I’m back with good friends. Enjoy your cozy wood heat, there is nothing like it! Your mittens are fabulous. I love the way you always line your mittens, what is your lining recipe? 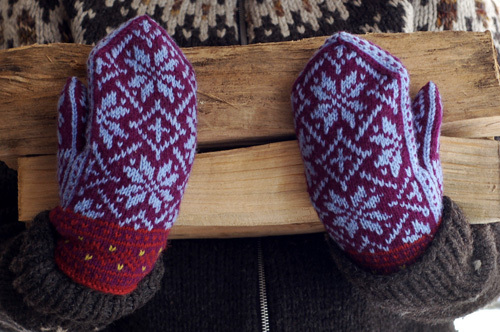 Do you knit them with the same number of stitches and needle as the outside, or do you go down a little? Jamie knits? Somehow I missed that when I read book 1 and 2. Great stove and mittens. I can’t believe you missed the Outlander series until now! Well at least you found it LOL! I’ve told my husband that I’ll always be faithful and he never has to worry about me, unless I someday meet a man who looks and acts like the image of Jamie I have in my head, then all deals are off LOL!!! Good thing for him that my chances of ever meeting a red headed Scot that tall with the required accent is virtually nil. I think that series of books are my absolute all time favorites. Happy reading! They are so gorgeous! I love the little accents on the cuffs. I love your color way! It is just awe-inspiring to me!! Lovely to stumble across your blog. We’re building a boat to live on at the moment and will be putting in a morso, just wondering which cookery book you have. Mittens are beautiful! I’m thrilled that you found the Outlander series. I found them way back in 1994 (when Voyager came out) and have re-read them too many times to count. The unabridged audios with Davina Porter are perfect for knitting. Oh, yes, Jamie. All men, I’m afraid, pale in comparison. What will we all do? And I just finished listening to the audio of the latest installment (40 hours or so). tulipgirl is right – perfect for knitting, or spinning or washing dishes. Ahh, the Outlander series – have to be my all time favorite books. If I ever met a real-life Jamie, my hubby should be worried :-) Unfortunately, don’t think that’s gonna happen – but he is definitely the perfect man. And your mittens – yum-o!! I agree – I never think of knitting cold weather things until cold weather hits, but then watch out! Thanks for sharing!